The Movie Sleuth: News: Stanley Kubrick's 'A Clockwork Orange' Coming to 4K UHD! News: Stanley Kubrick's 'A Clockwork Orange' Coming to 4K UHD! Warner Brothers closed out 2018 with the year’s most anticipated home video release of the 4K UHD of arguably the greatest film of all time: Stanley Kubrick’s 2001: A Space Odyssey. Currently the only Kubrick title to receive the Ultra High-Definition treatment on home video to date, this monument of cinema appeared on numerous polls for ‘Blu-Ray of the Year’ and inevitably begged the question as to when the remaining films in the director’s illustrious career would make the jump to 4K. 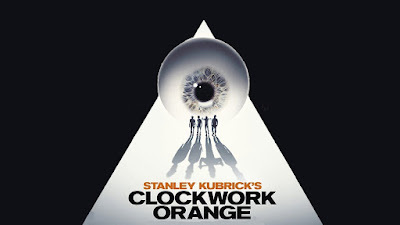 Last month, the BFI cut together and issued a new trailer for Kubrick’s second greatest and still powerful achievement A Clockwork Orange with news the timeless dystopian science fiction fable would be returning to British cinemas. Almost immediately, the film world started speculating what this meant for the 1971 masterwork. Would it be a new transfer or would it be, like the previously issued 40th Anniversary edition released in 2011, simply a repackaged port of the same edition released in 2007? Studios have had a longstanding habit of reselling older discs or digital masters with new sleeve art or menu design and Kubrick’s A Clockwork Orange for the time being is among those to have fallen into that category…until today. Sources from TheDigitalBits heard through the grapevine of Warner Brothers’ upcoming home video release roster that in late 2019, Stanley Kubrick’s A Clockwork Orange will in fact be coming to 4K UHD, making it the second Kubrick title to receive the high-end resolution treatment! Details are still developing but this comes on the heels of the BFI theatrical re-release and to call this announcement one of the biggest for home video of the year is putting it mildly! A Clockwork Orange has always been a title fans have clamored for a true full digital restoration for utilizing state of the art technology to breathe new life into it and as for myself, being my second favorite film of all time, this is a call for celebration! Stay tuned as this exciting news continues to develop!